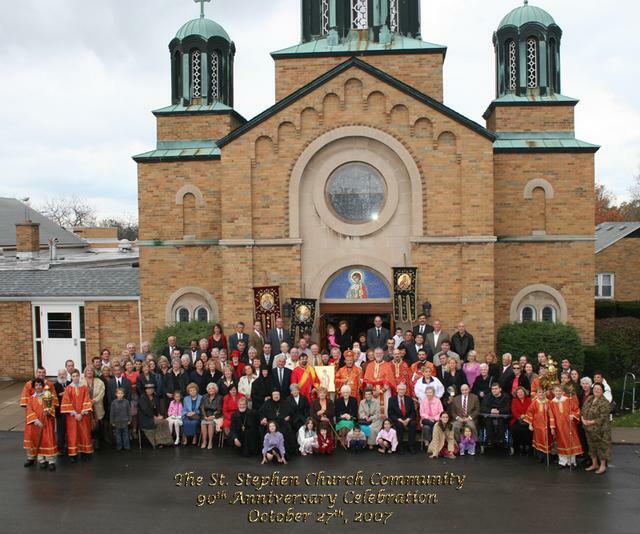 Lackawanna, NY - His Grace Bishop Mitrophan led a celebration of the the 90th Anniversary of the St. Stephen Church in Lackawanna NY on the weekend of October 26-28. The celebration began with Vespers and Confessions on Friday evening. Bishop Mitrophan celebrated the Divine Liturgy on Saturday, assisted by the local priest Fr. Rastko Trbuhovich and three priests from neighboring Orthodox Churches: Fr. Thomas Kadlec, St. Mary's Carpatho Russian Church, Fr. Christos Christakis of the Annunciation Greek Church and Fr. Peter Jackson of the Ss Theodore ROCOR Church. Also assisting were Deacon Milan Medakovich, a son of the St. Stephen parish, and Deacon Dragoslav Kosic from the Eastern Diocese. After the Liturgy a festive procession was taken around the church, and the 90th Anniversary group photo of the parishioners was taken. The celebration continued that evening after Vespers with a Dinner Dance at a local restaurant. Bishop Mitrophan was the main speaker, and presented five gramatas to worthy parishioners. Fr. Rodney Torbic, who attended the Anniversary Dinner Dance on Saturday evening, celebrated the Divine Liturgy on Sunday morning and preached the sermon. The celebration ended with a special festive coffee hour following the Divine Liturgy. The celebration was a happy affair, giving local, distant and former parishioners and friends an opportunity thank God for their church, and to visit and reminisce. The chair-persons for the 90th Anniversary Celebration were Peter Stevanoff, who also served as the Master of Ceremonies, and Mary Ann Bivolcic.